Shortly after moving to Pittsburgh, my friend and site designer alerted me to the existence of a hot dog place called The Original Hot Dog Shop in Oakland that had been around since 1960, which may not be old for Pittsburgh, but is damn old having come from LA. 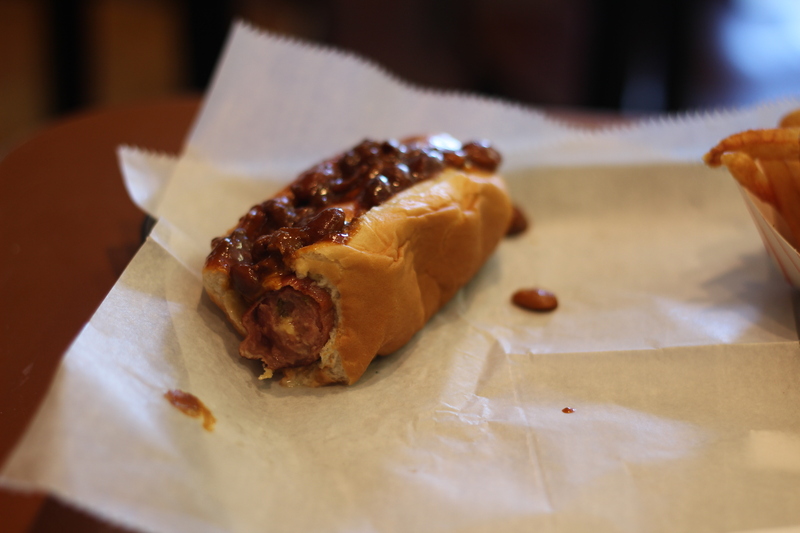 I like hot dogs and originals, but unbeknownst to me until showing up for lunch was that The Original Hot Dog Shop (also known as the Dirty O) is more of a late-night haunt than a lunch stop. Nonetheless, I wanted a good hot dog and was happy to eat it in a dingy spot with great late-night character in the middle of the day. Oh, just an oozing hot dog here. 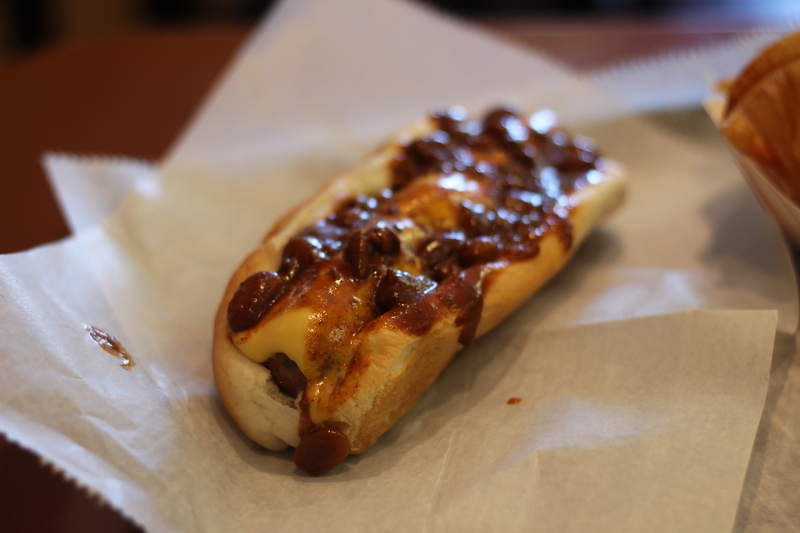 I ordered up a Jalapeno Cheddar dog, which has those classic flavors stuffed into the dog itself, then I topped it with chili and cheese. There were a bunch of toppings offered for free, but they were mainly veggies and I prefer to judge hot dogs with chili and cheese on them. I also ordered a side of their fries, which are possibly more famous than their dogs. The dog itself turned out to be, well, not really anything more interesting than it sounds. The jalapeno gave it a nice kick, the skin had a solid snap and the cheese on top was melty and tasty. The chili, though, was not exactly my style. Mostly beans, it could have handled a nice infusion of meat instead. It’s all about the fries, baby. 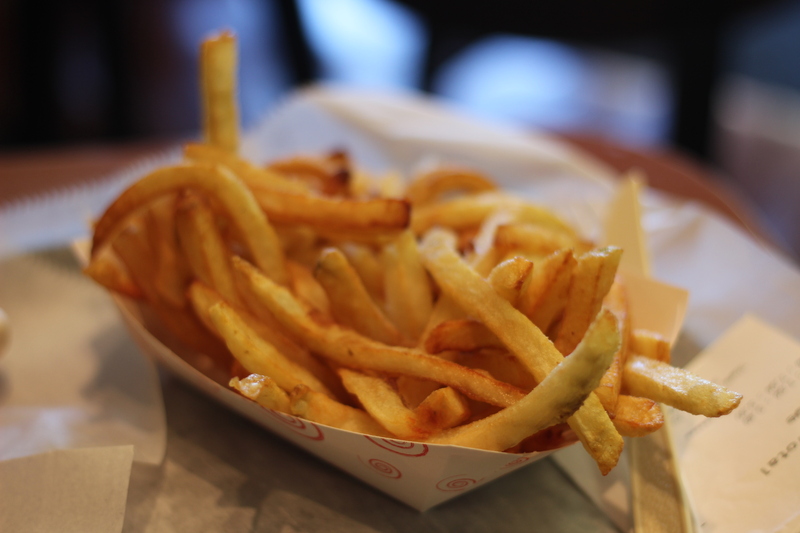 Alas, the fries did their best to make up for the disappointment of the chili. Truth be told, I didn’t realize the fries were so famous until after my visit, but without even knowing of their fame I felt they were some of the best basic fries I had ever eaten. At times they hugged the line of oversaltedness, but otherwise were cooked to a perfect crisp in some sort of presumably blessed oil. Should probably say Dirty O. As much as I like fries, I am not really the type of guy to seek out a place because of them. And since the hot dog itself was nothing special, I’m not sure that the Dirty O quite lived up to its reputation. Perhaps it is necessary to experience the place in the middle of the night to truly appreciate what they have to offer, but the bonus of eating there for lunch is the much lower probability of an old-fashioned mugging. I suppose life is all about tradeoffs.